I would like to respond with different email content based on the listing site. Can you add the listing site as an option on the Auto Responders set up page? Since homeaway won't pass the traveler's email anymore at all, I need a different response from those i send to travelers that request quotes from my own website, and other sources. Yep, this is rising in priority. We'll keep you posted as we get into it, but it should be soon. Just created auto responder and tested with VRBO. Noticed a few issues with how formatting is handled. 2. Changed bullet points to separate lines. better. Thank you for considering Blue Mountain Lodge for your vacation stay. ~ Blue Mountain Lodge is a private vacation home, rented out by owners (not a management company or an agent). ~ Must be at least 25 years of age to rent, and be present during the entire stay; No third party rentals. Minors under 18 can only stay with parent, legal guardian or responsible adult, and must never be left at the property unsupervised. ~ No occupancy above 12 persons (which includes adults and children ages 0 and up) at any time during the stay. ~ Property is not reserved in your name until deposit (or full balance) is paid and booking is accepted. Availability is real time and may change after this email is sent. ~ Rental Agreement signed by primary Guest and copy of valid photo ID are required if you decide to book. If the required is not returned within 72 hours from booking acceptance, we reserve the right to cancel your booking and issue a refund. ~ 60 day cancellation policy (full refund if reservation cancelled by renter 60 or more days before the scheduled check-in). ~ The exact address, driving directions and check in instructions will be provided after balance is paid and few days prior to check in. ~ Check in is3:00 PM ET and check out is 10:00 AM ET unless pre-arranged otherwise with the Owner in advance. Late check outs may be subject to docking of the deposit. ~ Our cabin has front and back yard with firepit. ~ All roads leading to the cabin are paved. ~ 'Like' Blue Mountain Lodge on Facebook - we post updates, specials, or availability due to last minute cancellations. Great tips and email template! HomeAway strips out a ton of formatting from the email in their effort to block all contact info. They basically convert everything to plain text, and their conversion algorithm can jumble stuff up. I had a look at your email template and there was still some hidden formatting in there that might have been confusing the HA system. I stripped every last bit of formatting for you -- AVAILGEN template -- try again and let me know if it looks better this time. I wonder if we should have a "plain text only" option on templates just for this sort of thing, something that doesn't include formatting at all. Thanks Chris. I happened to look at the searches for my listings on HA/VRBO yesterday and found that I had dropped from around top 100 to about 2000 of 2500 listings in Galveston. I called HA and they said it was because my ratio of bookings to inquiries was low. They thought that my content was fine but advised I should look at my competition to see what they are doing or saying in their listings that I'm not. The fact is that I send an OR quote to the prospective guest right after I send an HA quote so I think what's happening is that a lot of guests are seeing that my OR quotes are about $100 lower booking cost than HA (because of their admin fee and insurance) and the guests are gravitating to the lower cost quote from OR. So I'm going to try to just let those book thru HA to see if I can get higher on their search rankings. They are basically catering to the owner that has 1 or 2 properties that let's HA system do everything. I looked and have a lot nicer properties at similar or lower costs than much of the top 100. Guess we have to play the game their way or get struck out. Thank you, better. Now if I could only get a real vrbo inquiry! Yep! We added support for that on the autoresponder a month or two ago. 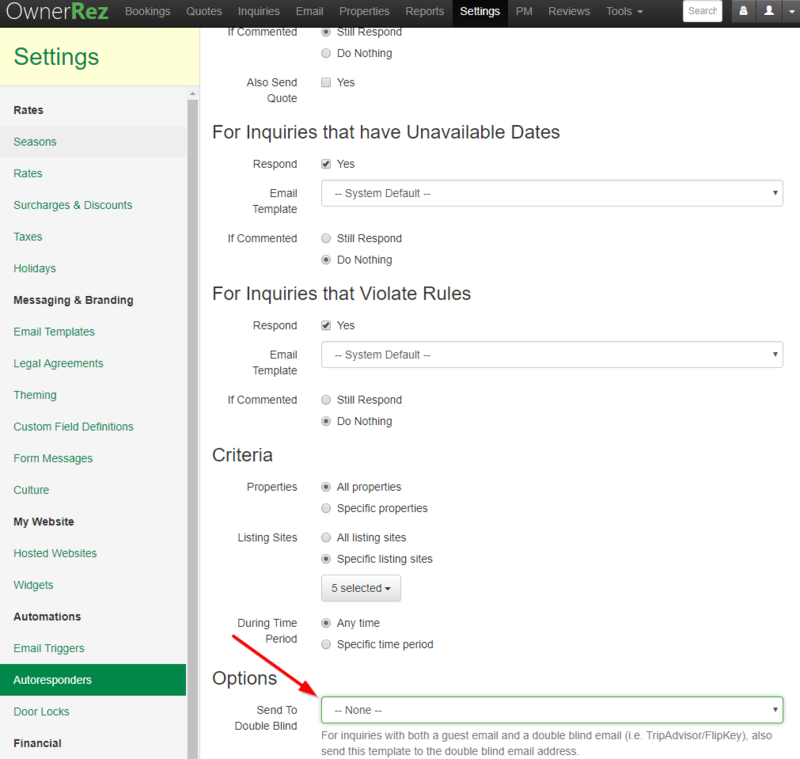 To configure, go to the autoresponder settings and pick a "double blind" template (see screenshot). You can use the same one or a different shorter one. That's currently only used for TA, but we'll be expanding it.